A boy and girl try to convince their parents to let them get a dog; they say it could guard the house and play with them. Mum and dad protest at first, saying that dogs need to be fed and walked, and they make a lot of mess. The children promise that they will take care of everything, and Mum gives in. The children set off for the Dogs’ Home, pushing the baby in the buggy. Their parents stress that they must get a dog with a pedigree. At the home the boy and girl don’t see the right dog at first, so they ask if there is a dog that nobody wants. A man shows them Courtney, an old grey dog, and the children decide at once that they are taking him home. Their parents of course are not impressed by this mongrel; the children are sent off to bed and Courtney settles down to sleep in the kitchen. Next morning there is no sign of him, but he comes back later in the day, dragging a trunk behind him. He appears to be well travelled. Courtney loses no time in donning a chef’s hat and apron, cooking a meal for the family, changing into waiter’s clothes and serving the food, playing the violin as they eat and then juggling to amuse the baby. As time goes on, he sometimes meets up with dogs in the park but spends most of his time doing household chores, watching television with the children or dancing with mum. Tragedy strikes one day when the house catches fire with the baby and Courtney inside; Courtney suddenly appears climbing down a ladder with the baby safely under one arm. Life goes on, but one morning there is no sign of Courtney or his trunk. The parents remind the children that Courtney is a mongrel who cannot be relied on. The boy and girl, once again pushing the baby along, report Courtney as missing at the police station. Needless to say, the officer doesn’t expect a dog who can cook and play the violin to be handed in, but he promises to let the children know. The following summer the family set off to the seaside for a holiday. Every day the children go off in a boat that is tied to a rock by a long rope. On the last day, however, the rope breaks and the boat drifts out to sea. Mum cries for help, and suddenly there is a tug as the boat begins to be pulled back to the shore by something invisible. The family never find out exactly who or what saved the children, but in one illustration near the end of the book the outline of an old dog can be seen on a cliff top, looking down on the family as they hug each other. 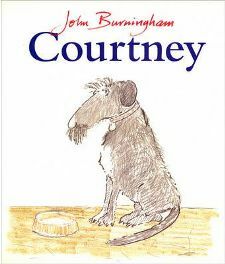 In ‘Courtney‘, John Burningham has created a delightful, imaginative story. It’s obviously total fantasy, but the children I read it to found the idea of a dog dressing up and doing household chores or dancing extremely funny. Although Courtney is an old and not particularly attractive dog, there is something very lovable about him and you can understand why the children decided they wanted him as soon as they saw him. I have to admit that it was not on first reading that I noticed Courtney’s presence on the cliff top in a picture near the end of the book, but when I asked the children how they thought the boy and girl had been saved, they were convinced that Courtney rescued them. Interestingly, Courtney is the only character in the story who is named. John Burningham illustrates his picture books himself and he is one of my favourite illustrators. He uses a fair amount of colour with line drawings that are usually quite sketchy; the colours bring them to life but are never overdone. Facial features are minimal yet still convey expressions and feelings. Dad obviously hates the idea of his wife leaning against Courtney as he plays the violin, although on the previous page he was delighted at the prospect of dinner cooked by the dog. Every page has a white background that makes for easy reading. Usually there are just one or two lines of text at the top or bottom of the page, sometimes slightly more. The font is large and clear. ‘Courtney‘ is definitely a book for reading aloud, but it is such a charming story that a confident reader aged around seven might still find it an interesting story. First published in 1994, ‘Courtney‘ is not the most up-to-date picture book and I’m not aware of a television tie-in, but two groups of children that I have read it aloud to have genuinely loved it. They were aged three and a half to four years old, but I’m sure slightly older children would still appreciate it. It shows us that it’s not always the most attractive creature that is the cleverest or most lovable one. It allows children to give full rein to their imaginations, and has an intriguing element of mystery at the end. I wholeheartedly recommend finding a place for Courtney in any home where there are young children.